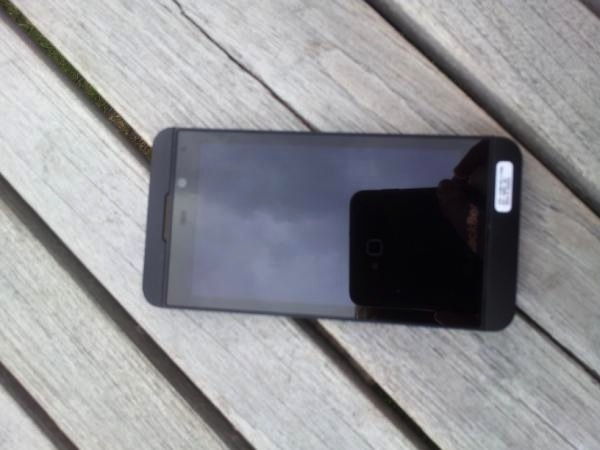 "Real Photo" of BlackBerry 10 Full Touchscreen Phone Emerges! Does this device look familiar? If you've been following along with all the BlackBerry 10 fun the last few months it should -- It looks pretty damn close to the image we first leaked back in January of what was rumored to be the first BlackBerry 10 full touchscreen phone. This image here comes via Twitter from @TyC4all who says it's the "first image of the pre-commercial version". We're not sure where it's from or when it was taken, but it looks awesome. You can just make out the BlackBerry branding on the bottom as well as the top speaker and front camera. It does resemble the BlackBerry 10 Dev Alpha a bit, but looks more refined. No saying if it's the final hardware but we'd be happy with it. It's definitely something we're looking forward too. What do you think? Love it? Want it NOW?! Sound off in the comments!